May is usually hot and dry, which is stressful to new plantings. Tender growth is susceptible to wilt when water is scarce. Large-leafed plants, such as clerodendrum, croton and datura, are among the first to show water stress in the garden. Base your watering schedule on grass and leaves. Water when they assume a sharp "V" shape or when large-leafed plants start to wilt. Your garden will tell you when to water. · Check irrigation systems for coverage and missing heads. Prune any branches or foliage that are blocking irrigation. Reliable rains should resume in June. · This is the month to get rid of winter annuals. Replace with marigolds, caladium bulbs, zinnia, coleus, torenia, vinca, portulaca or amaranthus for summer color. Plant vegetables such as sweet potato and okra. You can plant any permanent plant in the landscape as long as water is available. Watering is critical with new as well as established plantings. New plants are growing vigorously and need water to avoid wilting. The rains of June are just around the corner. · Lawns are starting to grow rapidly again. Keep alert for insects such as chinchbug and armyworm through the summer months. Lots of chewing insects are busy now, including the lubber grasshopper, which loves crinum and spider lilies. Caterpillars and maybeetles do a lot of chewing damage and weevils will notch the leaves of many plants and attack roots. The royal palm bug is also active until June, when rains wash them away. Rain also eliminates aphids, spidermites, thrips and other small sucking insects. Scale and mealybug are becoming more active. Whitefly, snails and slugs are also showing up in large numbers. · May is one of the best months for taking cuttings on woody shrubs such as crotons, ti, dracaena and hibiscus. Grafting and air layering can be done now. Green Thoughts: If you are re-landscaping, try to group plants that have similar water, environmental and light needs. What makes a plant incompatible with its environment? Basically, it's what it does and does not tolerate. If you live near the ocean, for example, use salt and wind tolerant plants such as Indian hawthorn, spider lily and crinum lily. Sometimes, though, even plants labeled "salt tolerant," such as bougainvillea, oleander and ligustrum, can look fried when they get full exposure to salt winds. Salt tolerant plants usually don't like too much water. Be careful because pittosporum and carissa can get root rot. Gardenia is one of the first plants that new Floridians want to put in their gardens because they remember these fragrant white flowers as corsages and as table decorations. But gardenias are fussy, and many people are disappointed. For best results, plant them in an open flower bed away from house foundations, pools and walkways. They are acid-loving plants, and the high alkalinity near concrete almost guarantees they will have nutritional problems. Most gardenias are big growers and should not be planted close to doorways or in other tight areas. I planted my gardenia from a 3-gallon pot in 1982, and it is now 10 feet tall and 12 feet across. Gardeners who plant them in the wrong places find they have to prune them back. Since they bloom at the ends of the branches, pruning eliminates flowers. In Florida, gardenias must be grafted if they are planted in the ground because microscopic nematodes can clog up the root system and kill them. They are grafted onto Gardenia thumbergia, a nematode-resistant stock. Look for the main show of flowers from mid-April to mid-May. A scattering of flowers will continue through August if the plants are well fertilized. Fertilize in March, June and October with an ixora/gardenia fertilizer to combat nutritional problems. 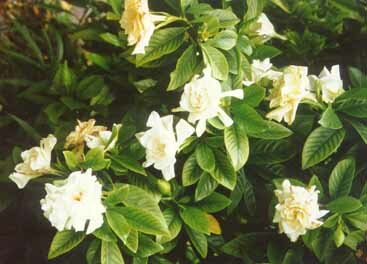 Try the small growing `Vetchii' gardenia, which grows to about 4-5 feet and blooms off and on throughout the year. The flowers are much smaller that those on the larger plant, but the fragrance is the same. Big growing varieties include: Miami Supreme, Glazerii, August Beauty and Mystery.